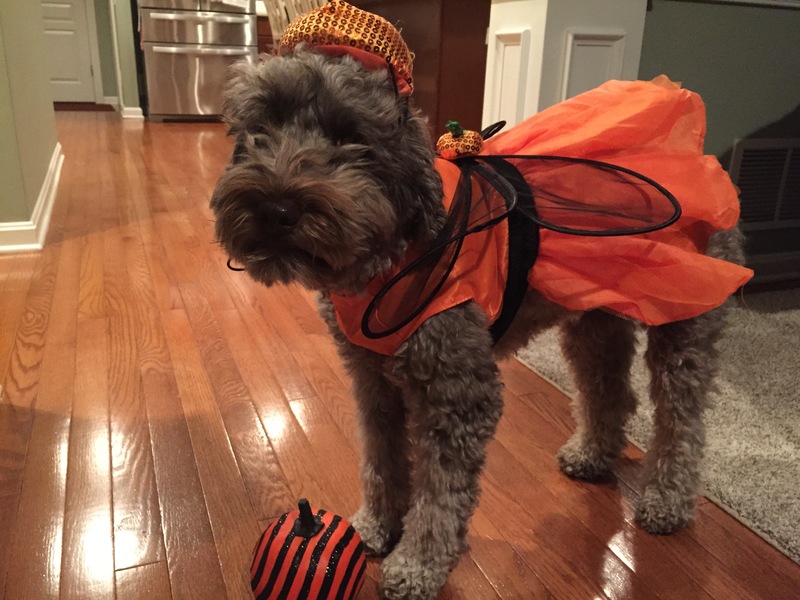 Belle, our 3-year-old labradoodle, is ready for Halloween. I did buy a huge bowl of candy, but just realized half of the candy is missing! I made the mistake of opening the bags. One piece then led to another….and another…..and another. Wonder who ate the candy…….? I will be making a quick trip to the store again for candy. And this time, I am going to hide it from my family. Halloween can be fun for kids, but it also a time when you should have a safety talk- especially if this is your child’s first time trick-or-treating. I have listed a few websites with safety tips for kids and pets. We have a sweet, but very naughty dog who loves to get into things. Remember to keep candy out of your pet’s reach. Chocolate can be toxic to pets. Recently, I left a plate with my son’s lunch on the counter. Way out of Belle’s reach. She must have superpowers because the plate was on the ground when I walked into the kitchen. 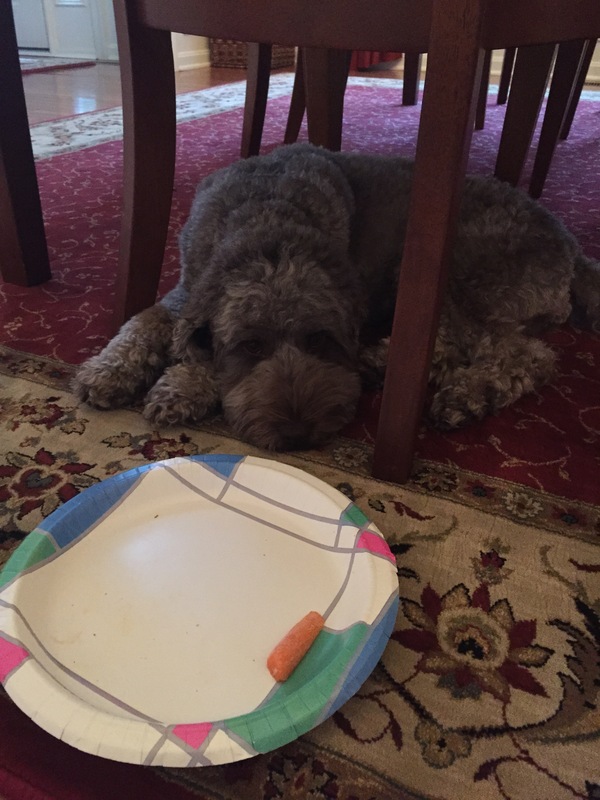 She ate everything- a healthy carrot remained! She was hiding under our dining room table. Looking VERY guilty! Try adding reflective tape to costumes and candy bags. This will help you to keep track of your children, especially when they get into a group with other kids. Additionally, it will allow drivers to see your children when they cross the street. For pets- remember outfits can get twisted on external objects on your pet, leading to injury. I learned this lesson last year. Belle was wearing a shirt that became caught on my fireplace screen. She panicked, dragging the heavy, metal screen with her. If she wears any clothing, it is only for a few minutes now. Spooked pets can get lost. 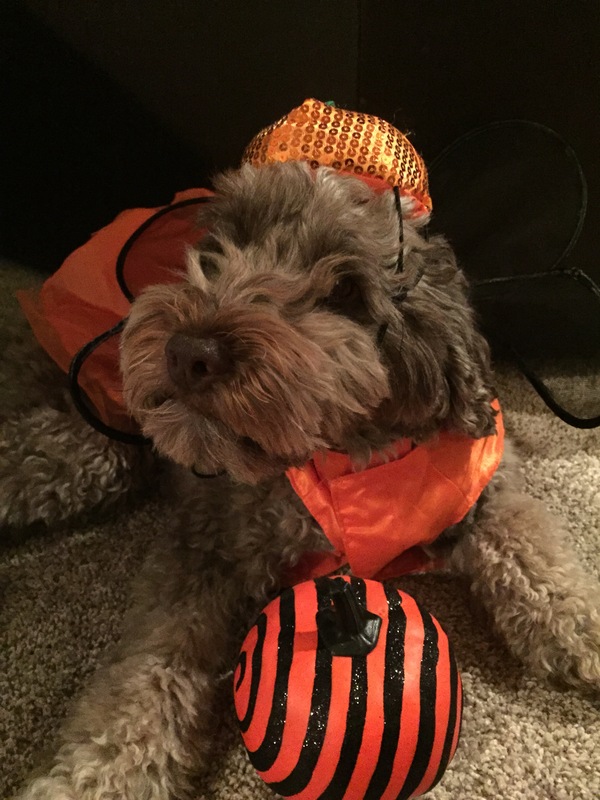 Belle will be spending time in her crate during trick-or-treating. She acts crazy every time someone knocks on the door. I don’t want our night to end up with our family searching the area for our lost dog.